Consider enhancing your beautiful deck with stylish deck lighting for fall entertaining. While your deck is already a beautiful part of your outdoor space, there are plenty of additional accessories that can accentuate its function and design even more. As the summer slowly transitions into early fall months, your deck will undoubtedly continue to be used for early fall and fall entertaining throughout the season. With this, consider enhancing your beautiful deck with stylish deck lighting. This step will allow you to create a glow around your deck for crisp fall nights by using smaller lights installed around your deck for soft lighting in your outdoor space. Consider the many ways you can create a perfect fall entertaining space with deck lighting as an accent feature. Particularly if the back of your home is visible from the street, deck lighting can play a significant role in enhancing the curb appeal of your property. Similar to the way in which your deck is an accessory of your home, your deck accessories also contribute to the overall look of your home exterior. Incorporate a variety of deck lights in your outdoor space to highlight your favorite features of your deck, such as steps, railings, and the perimeter of your space. Although you may only associate your deck with summer entertaining, it is also a perfect place to enjoy a chilly evening in the fall. As the sun sets early in the late fall or winter, deck lights are a useful and stylish accessory to light up your outdoor space for a bonfire or party. Deck lighting can also help to set the mood of a party as you are entertaining outdoors throughout the fall. For a late September bonfire or a Halloween party, use your deck lighting as a form of soft lighting to accent your outdoor space for a party. This addition will allow you to incorporate stylish light that is much more fitting for your event than a single bright floodlight or only a fire pit. Make the most of your outdoor entertainment space with uplighting, downlighting, or transverse lighting to accessorize your party and accommodate your guests. In addition to being a beautiful accent feature for your deck, deck lights are the perfect additional safety feature for your home. Whether you’re outside stargazing on a fall night or entertaining on your deck in the evening, deck lighting allows you to ensure that your guests can use your stairs safely in the dark. 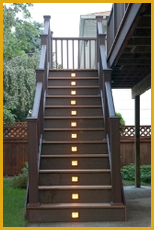 Consider the addition of railing lights and step lighting as useful tools for guiding guests down your deck steps in the dark, especially if you are entertaining guests with young children who may struggle to get down the stairs as the sun goes down. Enjoy Fall Entertaining on Your Beautiful Deck!